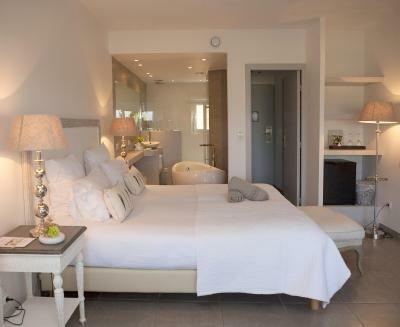 Lock in a great price for Hôtel Font Mourier – rated 8.7 by recent guests! Restaurant and pool area are modern and fresh. Room is extremely small and difficult to even place luggage around the bed. 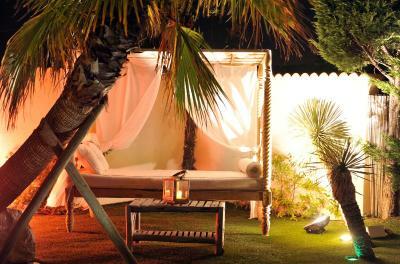 Good location close to saint tropez, but for the price, you should just pay a little extra to be in the city itself. Quiet. Nice pool. Good ambience in breakfast and pool area. Kind staff. It was very charming and very well laid out. Comfortable. Very good and quiet location at the top of a hill not to far from St. Tropez. Rooms are nice and very cosy with nice balcony or direct access to the garden. The swimming pool is the center of the hotel with very nice sofas all around it and in the garden. All is done with very good taste and very clean. The breakfast was one of the many surprises we had. A large choice of french and European food with fantastic taste. The personnel was really kind and helpful. A special thank you to the Italian guy serving the drinks at the bar (I forgot the name). The staff are really friendly and very helpful, they make you feel at home. The hotel location is perfect and not far from the center if you have a car. The garden and pool area are so relaxing you could spend the whole night at them without feeling bored. It is a really nice hotel. The greenery around this hotel makes you feel so relaxed. Beautiful property with friendly helpful staff. Our room was very comfortable and quiet. We ate in on 2 occasions and the food is good. The decor of the hotel is lovely, the pool area was beautifully furnished in particular and my favorite part of the hotel. The staff were amazing and very helpful. 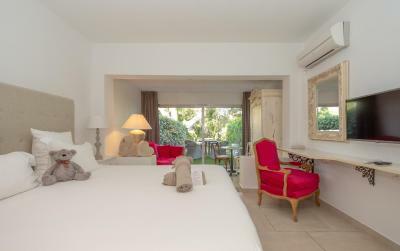 One of our top picks in Cogolin.Set in a pine forest overlooking the gulf of Saint-Tropez, Hôtel Font Mourier offers free WiFi access, a tennis court and a heated outdoor pool. 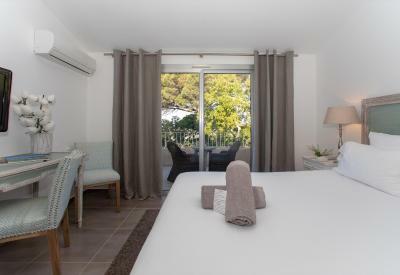 Each air-conditioned and soundproofed room has modern décor and a private terrace or garden with a view of the pine forest or the plains of Grimaud. They have a private bathroom with a bath. 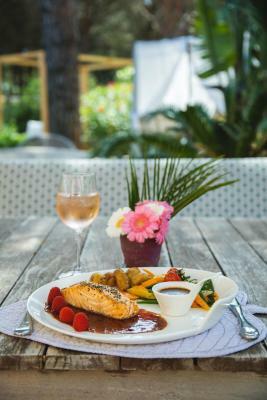 The restaurant serves traditional French cuisine and a buffet breakfast daily. Guests can enjoy a drink at the hotel’s bar or in the garden. Hôtel Font Mourier offers many activities, ranging from water sports, hiking and wine tours. Hôtel Font Mourier is located only 1.2 mi from the beach at Port Grimaud, 2.5 mi from Saint-Tropez and 3.7 mi from the Pampelonne beaches. 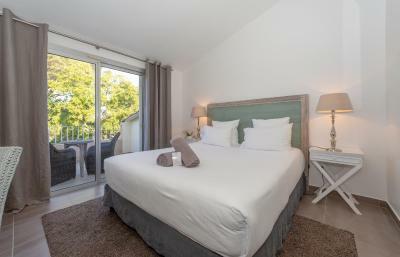 When would you like to stay at Hôtel Font Mourier? An extra bed cannot be accommodated in this room type. This spacious room is air-conditioned and has a balcony. This suite features a large terrace or balcony with a hot tub. All rooms have a private balcony or terrace. 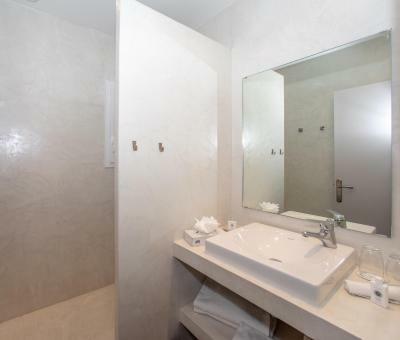 There is also a mini-bar and an private bathroom with a bath. All rooms have a terrace with garden views. 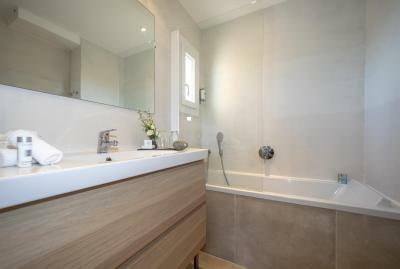 There is also a mini-bar and a bathroom with a shower and a bath. This quadruple room features a seating area, soundproofing and flat-screen TV. House Rules Hôtel Font Mourier takes special requests – add in the next step! 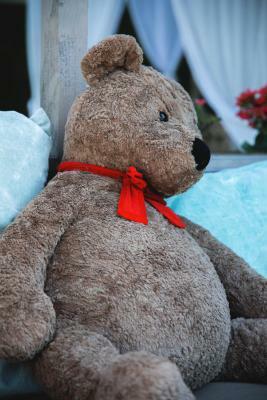 One child under 2 years is charged EUR 20 per person per night when using existing beds. Hôtel Font Mourier accepts these cards and reserves the right to temporarily hold an amount prior to arrival. Please note that 7 days prior to arrival, the property will do a pre-authorization of 100% of the total amount on the card provided at the time of booking. The pictures looked much better that the room actually was. Think walls, so very noisy. I really want to have more time to stay. The area is relaxing but during rush hours it can be challenging to got to Saint Tropez. There are not many alternatives NEAR BY to the restaurant in the hotel. The hotel is a wonderful surprise, you don't expect to find when you are driving up the steep road around a closed community living area on the hill. It is hard to describe. I thought many times, if I could afford a private house at the Côte d'Azur I want decorate the interior the same. There is natural high class "sérénité"a kind of Laissez-faire but always combined with a high class service and very friendly staff. The rooms are charming and clean, the pool area is just marvelous and the restaurant and breakfast are is so relaxing you just enjoy the high quality (despite the corresponding price) of the dinner and the breakfast. My personal recommendation have a late wake up and take a kind of brunch and then in the evening enjoy a high quality dinner at an exceptional place. Saint Tropez is just few minutes away and also amazing peach (Plage de Pampelonne) with a nudist area. From the other places around I enjoyed Grimaud. The other areas like Cogolin can be neglected. Quality of internet connection (wifi) could be better. Insects inside the room. They should have insects repellent machine inside the rooms. Honestly the bathroom is too small. Plastic toilet covers not okay for this hotel. Lumpy pillows. Needs better mattress too. Food prices too high for hotel. Five star prices. Needs shaded parking. Breakfast is extra and quite expensive at 25 euro per person. However I'm told it is excellent. Also the property is isolated which means it's very peaceful but a car is practically essential in order to explore the surrounding areas.